responsibility for any of the entries listed below. Take Off My Sunglasses’ Rodriguez. of the USS Saratogo which are, in fact, unbelieveable. Officer of the IC work center is IC2 Danny Waldrop. with the “hillbillys” in the other gangs. individuals who are a part of it. GTMO should remain only in our cranial archives. remember it) I already know about it! Bring it on. we picked up the eye portion of an old mooring line. forth like a pendelum. Constant BOOM, BOOM, BOOM. out. What a relief it was to get rid of that booming. with a steam hammsr tring to unstick our keel anchor. pretty unorthodox (boy is that an understatement!). it was the drone that we had been waiting on. us worked in air conditioned spaces. s one of many stories I hope to write. waiting to leave just as we were boarding the ship. Hey McCranie, you better get your buddy!! away hoping this would pass in short time. dragged him off the quarterdeck. and it all passed without incident. BMC didn’t care much for me after that!! Coast Guard Meritorious Service Medal. many of you I am sure, hope it never happens again. trays. It was an exciting little adventure. thought we were going to die) and it was off to Gitmo. We were all set for Gitmo as we had come prepared. s throats not long after that. here. Chief what the hell are you talking about?. it look like I knew what I was doing. Ok, I can do that. look like they are ready to all have heart attacks. through the metal pulley attached to the kingpost. remember the fun we had then? noises as all you hear on TV is the sanitized version. his ID to come aboard, he dropped it in the water. of time as the OIC of class C liberty risk. malfunctioned. Thats what the gunners told me later. quickly put out the fire on the carrier. topside one in our view. there wasn’t and not one lost soul from that accident. us back up then off we went to cross the Arctic Circle. being in deep sh*t and not much being said about it. else remember anything more. E-mail me if you do. cake walk that he expressed. head back to the monotony and stress of the gun line. But back to the night of 28 Feb 1984. GQ. Up into the dark I went to be the GQ OOD. line and the gun on target. klunk, somehow we got all 20 out. Jeff were ready to choke each other but we did it. out the ambulances coming in to save the attackers. Navy wasn’t needed again that night. 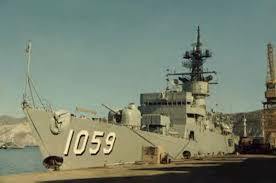 The SIMS was the last ship to fire at Beirut in 1984.
the movies but we got it out. Trieste, but thats another story. the last rounds on the Lebanon/Mideast Conflict? ordered to a gunfire support location. We had been there for months, and not a whisper. to shoot! This was our Big Chance!!! the computer. It seemed like it was in slow motion. four salvos, rapid continuous fire.” “BOOM! BOOM! followed. “BOOM! BOOM! BOOM! BOOM! And, again. and took over, but didn’t get a chance to fire again. might add) a horse collar to be air-lifted to the USS. witnessed that view of the SIMS at sea from the air. dangling in a horse collar! Oh, but it gets better. was being thrown about like a cork in the bath tub. that fall than from the shoring. what happened then is a completely different story! House, making it impossible to keep your footing. where SIMA repaired the shaft seal. d*mned ASW ship in the Navy. line so the Sonar gang could perform their magic. never let me forget about it either! transition from civilian to sailor and back to civilian. sharks, just to see if he could make ’em go belly up. As the years went by, guys would come and go……..
the puke out of the sinks. Ah…… the memories. ME!” (Meehan, you set a wonderful example for me…. am, I also got to clean sh*tters one last time! week and cleans MY sh*tters! was more impressed than Chief Blackshear was! life. Dave Bridges Served on the Sims 1974 – 1977.